This is a waterfront one-bedroom suite that was originally constructed in the 1950's with a recent renovation. Located near the main lodge it is situated right near the marina area. Parking for your car or boat are near your cabin. The cabin consists of two main rooms. The first room is the great room which is your cooking, dining and sitting area. 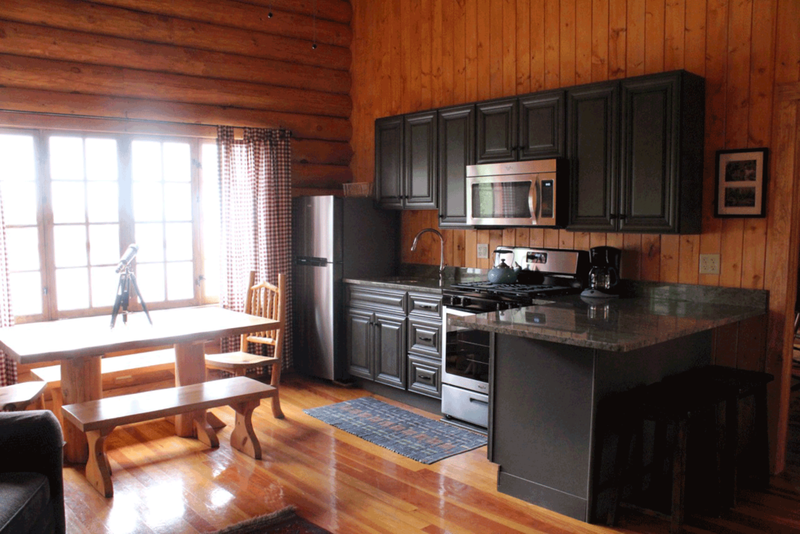 The kitchen offers a 4 burner range with oven, full size refrigerator/freezer, and microwave. It is equipped with basic dishes, pots & pans, utensils, wine glasses, coffee maker, microwave and toaster. A charcoal bbq grill is located outside the cabin. Two comfortable chairs with an ottoman give a comfortable place to enjoy the views. The main windows are west-facing and offer great sunset. A gas fireplace provides wonderful ambiance and heat. The bedroom has a queen bed, the bathroom has a beautiful walk in shower. Maximum capacity is two guests. The 2019 rate is $ 2 485.00, when available by the day: $ 391.00.